This Playground was a first for Omnitech playgrounds, by bringing a custom concept to life. Omnitech Playgrounds worked closely with Council throughout the whole project and have finished an impressive play space for the community to enjoy. 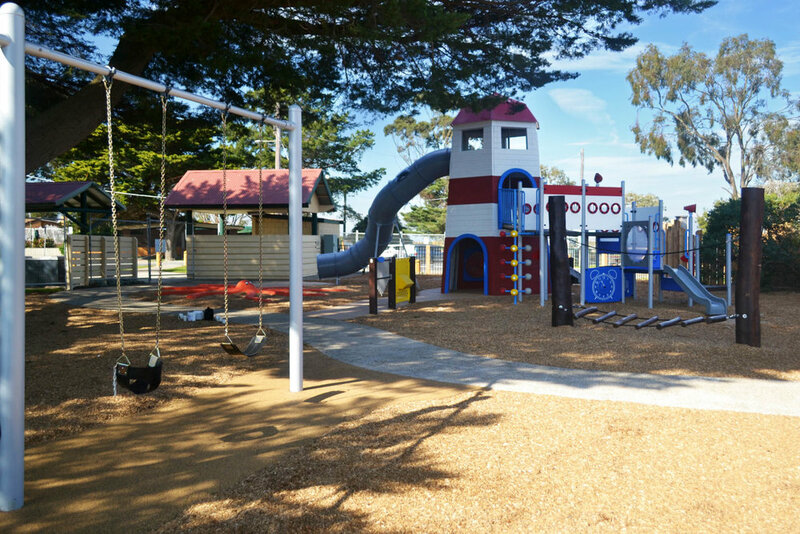 Inspired by the landscape around Tooradin foreshore, the equipment has been custom designed to suit. Featuring a 4m tall lighthouse tower with slide, in ground rubber octopus, natural timber log balance, orbit, crab Tri Roka and Swings. The range of equipment can suit children of any age and ability level. Through climbing, swinging, balancing, sliding and spinning, this playground caters for a range of play activities, creating a fun, inspiring play space for children. The inclusion of a rubber path and ground level panels along the path and inside the base of the lighthouse allows wheelchair and lower ability level children, to still navigate through and play in the space. Built in our factory in West Heidelberg, the tower was made using Cyprus Pine Timber slats with a galvanized steel frame. The Octopus was sculpted in concrete then coated with wet pour rubber and rubber paint was used to draw the eyes on. The equipment is durable and robust producing a playground built to last. By incorporating the natural elements and a colour scheme sensitive to the area and theme, this playground provides multi-dimensions of play activity. Creating a destination playground that is keeping the local community very happy.